Phenylalanine is an essential amino acid since other amino acids are formed from it in the body. Along with tyrosine, it provides raw material from which the body makes the hormones adrenaline and thyroxine. The body can also convert phenylalanine to tyrosine but not vice versa. Phenylalanine comes in two forms, L-phenylalanine (LPA) and D-phenyalanine (DPA), which are mirror images of each other. LPA has the nutritional value, while DPA has painkilling and depression-alleviating properties. A third form, DL-phenylalanine (DLPA) is both nutritional and therapeutic. Phenylalanine is effective for weight control because of its effect on thyroid secretion. It also plays an important role in the control of appetite. If taken before meals, it suppresses the appetite substantially. This amino acid is also essential for the efficient functioning of the kidneys and the bladder. Phenylalanine has many therapeutic uses. It is considered beneficial in the treatment of obesity and is being successfully employed as an appetite suppressant for this condition. It has been demonstrated that in the intestinal tract, the amino acids tryptophan and phenylalanine trigger the release of cholycystokinin (CCK) which induces satiety, and a termination of eating. An intake of half a teaspoon of phenylalanine powder 30 minutes before each meal, can lead to a loss of as much as 100 to 200 g of weight a day. Studies have shown that DLPA can alleviate the pains of chronic conditions such as arthritis, lower back pain and headaches by protecting endorphins - the natural pain- blocking hormones secreted by the nerve cells. You may buy phenylalanine here. The other positive effects noticed after 24-48 hours of taking phenylalanine are a feeling of greater alertness, an increase in sexual interest, and memory enhancement. It diminishes depressant feelings, if any. 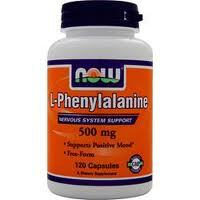 The depressant states are generally relieved within a few days by taking 100 mg-500 mg of 1-phenylalanine per day.